Sulaiman Famro is a cheerful, 65 year old engineer, and a master of branding. He built the prototype “Farmking” three years ago and claims he can save the country $1 billion a year, just in savings on starch importation. The Farmking is a one-stop processing plant for cluster and farm-site processing of root crops and grains. It has a diesel powered engine that allows for remote processing, with power out connections for lighting so that it can work all night, if needed. On one end you have 3 devices, for chipping, grating and milling. In the middle is the power plant, and in the rear is a large steel drum that can hold 50kgs of milled cassava, that uses a spin filter to process up to 2.5 tons of milled cassava into starch. 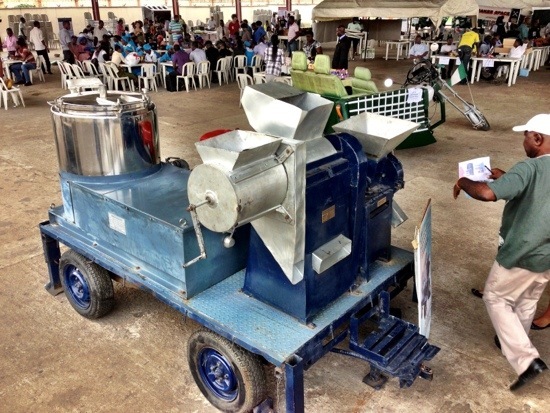 It’s used for processing of cassava, soya beans, maize, sweet potatoes, yam and many other roots and grains. One of the more interesting uses for it is the capture of starch. Apparently there is a huge amount of waste when the processing of cassava happens in the country right now, instead of being captured it is left to seep into the ground. An incredibly wasteful, manual process currently, Sulaiman is lobbying governors of different Nigerian states to get the Farmking into their areas.